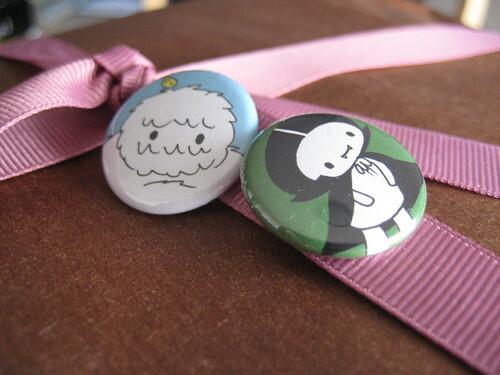 As mentioned previously, I participated in the Lovely Package Exchange organised by Danni of Oh, Hello Friend. She must have done a phenomenal amount of work matching up 250 exchange partners. 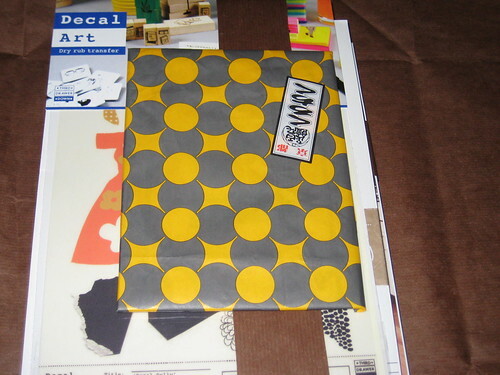 The idea was to exchange a package with a partner, with a focus on beautiful packaging. 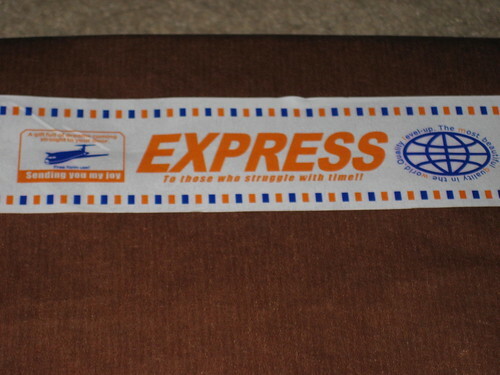 Sarah listed one of her "likes" as "eco-friendly" so I knew she wouldn't mind me recycling this brown wrapping paper from Brown Button Trading. This is a gift card illustrated by Beci Orpin, that came with an old issue of Frankie. 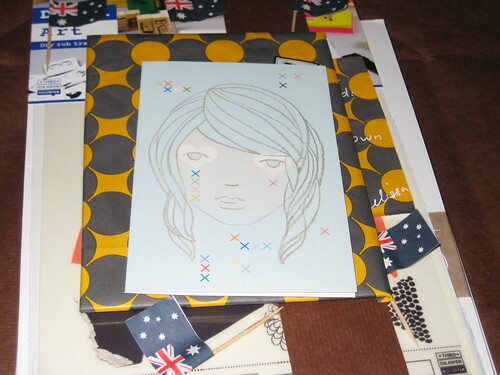 Everything I included in the package has an Australian theme (with the exception of the Japanese wrapping). Note that I've included some Aussie flags in a fit of patriotism. 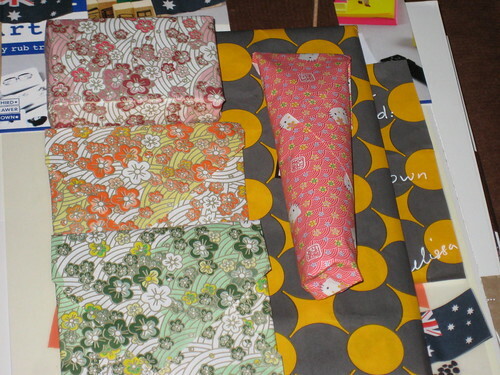 Here are some smaller items wrapped in origami paper - on the right, in the Hello Kitty paper, is some Lucas Papaw Ointment, which I thought would be funny because Australian models always list it as a "must-have" product. On the left (also wrapped) are some rainbow bookplates by Tall Rabbit and mini-cards by Nonworkers (both from Made On the Left) and elephant bookplates from kikki-K. Wrapped in a recycled Japanese paper bag is a free DVD, Cut & Paste, featuring Perth artists and musicians. This issue included all these little illustrations of people roller-skating by one of my favourite Perth artists, Sean Morris. Next, some art decals by Aussie illustrator Kat Macleod, for Third Drawer Down (purchased at one of my favourite local stores, Remedy. PS they do international shipping.) By the way, check out Kat Macleod's house tour on The Design Files. 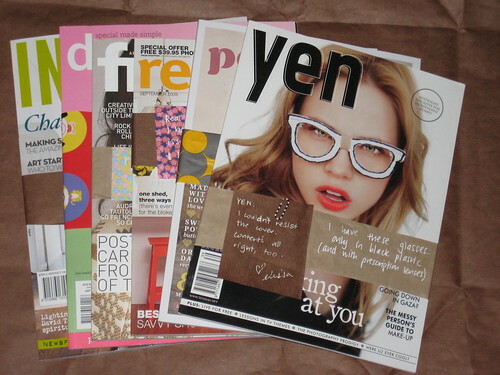 Finally, I included a selection of Australian magazines that I thought would appeal to Sarah, as she is a fan of decor magazines (like dear, departed Domino) and fashion. I had planned to include more but the postage costs were prohibitive (this just scraped in under 3kg, i.e. $70)! Sarah requested Frankie so I added women's mags Yen (how cool is the cover?) and Peppermint ("Australia's first eco-fashion magazine", which is beautifully illustrated). As a children's designer, I thought she'd like Donna Hay Kids' Magazine (which has drool-inspiring recipes, styling and even kids' clothes and decor - so glad I had an excuse to buy it!). I rounded it out with Aussie interiors titles real living and Inside Out (which I think are better than the US interiors mags I've read). Inside Out even featured a look inside Beci Orpin's home. (Hint - if you can't get your hands on a hard copy, you can read quite a bit of the content online at the Inside Out site. They also have a blog.) Also check out Natalie Walton's (Deputy Editor of real living) blog Daily Imprint. Why does blogger format my paragraphs so shoddily?